Chris Graham: Inside how Michigan State sneaked past UVa. 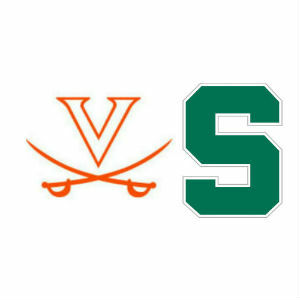 Front Page » Sports » Chris Graham: Inside how Michigan State sneaked past UVa. It starts and ends with shooting. UVa. got its usual run of open looks from backdoor cuts and screens freeing up three-point shooters, and just couldn’t knock them down. Virginia was 20-of-57 from the field for the night (35.1 percent), 10.3 percent below its season average, and was just 6-of-18 from three-point range (33.3 percent), a slight tick down from its 35.7 percent season average. From a review of the play-by-play, UVa.’s biggest troubles came in the lane, where the Cavs were 11-of-19 on layups and dunks (8-of-11 in the first half, 3-of-8 in the second half). Michigan State actually outperformed UVa. and its Pack Line defense in the lane (13-of-19 overall on layups and dunks, 5-of-7 in the first half, 7-of-12 in the second half). How did UVa. hold up on the boards? Michigan State message board posters were probably surprised at how well UVa.’s ACC-leading rebounding group fared against their Big 10-leading rebounding group. The Cavs outrebounded MSU overall 35-32, and pulled down 14 offensive rebounds while limiting Sparty to seven offensive boards. Free throw bugaboo? Virginia’s Achilles heel all season was on the foul line (67.2 percent as a team), but the ‘Hoos were a more-than-respectable 13-of-17 (76.5 percent), though there was a key miss from the line midway through the second half that didn’t help. Harris, coming out of a media timeout at the 7:32 mark, with UVa. down 45-42, missed the front end of a one-and-one. Star power. The Virginia defensive game plan was keyed on stopping two Spartans: Gary Harris, who was utterly shut down (six points, 2-of-5 shooting, after coming in averaging a team-high 16.9 points per game), and future NBA Draft pick Adreian Payne (who came in averaging 16.6 points per game). Payne got his points, finishing with 16, but was much less efficient than he was statistically coming in (5-of-12 from the field, 2-of-5 from three last night, 51.5 percent from the field, 43.8 percent from three coming in). Virginia also shut down MSU’s third leading scorer, Keith Appling (11.7 points per game, 45.5 percent field goal, 37.0 percent three-point field goal coming in, 2 points 1-of-3 shooting vs. UVa.). The difference was Branden Dawson, who averaged 11.0 points and 8.3 rebounds per game on 62.1 percent shooting coming in, and exploded Friday night with 24 points, 10 rebounds and a 9-for-16 effort from the field. “He’s an athletic player, he’s quick, he’s physical, and I don’t know if we underestimated him or what, but he got going early and was able to get on the glass and get in front of the rim,” said AKil Mitchell, UVa.’s defensive stopper, who went back and forth between Payne and Dawson, who Bennett tried to check with Mike Tobey and Anthony Gill. Gill went down in the second half with a sprained ankle, and Tobey just couldn’t keep up with Dawson, getting into foul trouble in the first half with two fouls before being relegated to the bench for defensive reasons later on, logging only 10 minutes. JPJ North. Worries about how UVa. would travel with UConn, whose Storrs campus is just two hours north of Madison Square Garden, were alleviated during Friday’s first regional semifinal, which was played to a half-full MSG as the UVa. fans who snatched up tickets online leisurely made their way in. A loud U-V-A! chant greeted the ‘Hoos to the court for pregame warmups, and it was obvious that at least half of the more than 19,000 in attendance, and probably a good bit more than that, were rooting for a Virginia win,.